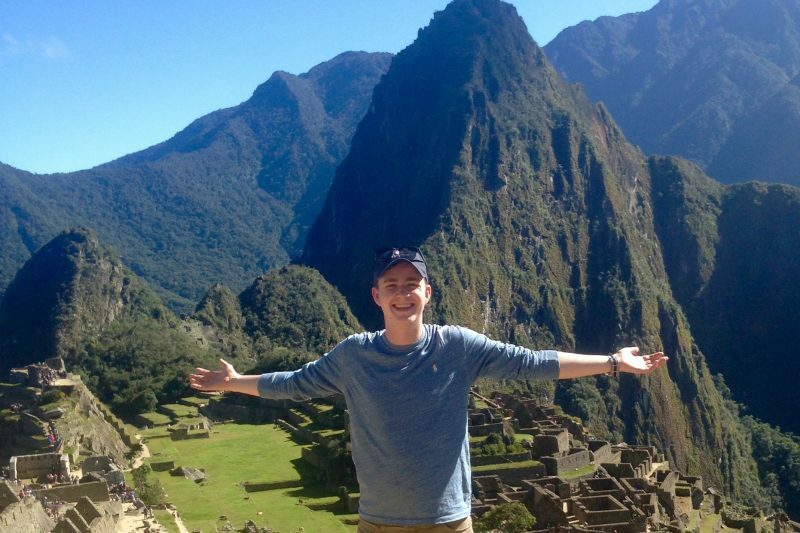 Greeting Opportunity with Open Arms Shadowing doctors in Peru allowed Bryan D'Ostroph '19 to practice his Spanish and firm up future career plans in health care. This summer, I completed a health care-based internship through the Shepherd Poverty Program in Cusco, Peru. I was thinking about potentially going into a career in global health, so this was a great introduction to the health care system of another country. Also, this was a great way to push my communication boundaries, with Spanish being my day-to-day language. This internship was funded by the Shepherd International Internship Program Grant, Goldman Sachs Endowment for International Experiences, and Johnson Opportunity Grant. What was the best part about Cusco? Cusco has such a rich history, from being the capital of the Incan Empire to the cultural heritage the Spanish left behind during Peru’s colonial period. Exploring this history and visiting some of the famous sites in and around Cusco was my favorite aspect of this beautiful city. An average day had me working at my project site, Polioclinico Belen, for the morning and afternoon shift. Originally, I was observing and assisting the general medicine physician with patient visits, helping to take vitals, performing basic physical exams, and explaining health education information. After that, I shifted roles to being a laboratory assistant and helping the technician with various lab exams (i.e. urinalysis, hematocrit, biochemical analyses, etc.). To ensure that my Spanish was still advancing, I had conversational Spanish lessons two days a week at a school in Cusco. What was the most fulfilling aspect of your experience? I think helping with the health education efforts, which combined various doctors and departments in the clinic, was the most rewarding. For some people who come to the clinic, this was their only contact with health care and they seek out the clinic very rarely. By educating them, the hope is that they will take that information back and apply it in their life to be more aware about certain diseases and their risk factors. One of the biggest challenges I faced was sometimes feeling a bit helpless with certain patients. Currently there is a strike of doctors in Peru, leaving the hospitals basically closed. On a few occasions patients would come into us in emergent condition, and since it is an outpatient clinic, there was very little for us to do to help them. It was incredibly difficult sending them away and knowing they weren’t well. Who served as a mentor to you this summer, and what is the best thing they taught you? Dr. Kelsing Contreras has been the biggest mentor to me this summer during my internship. On most days, I saw patients with him in the general medicine department. The most valuable thing that he taught me was the culture surrounding health in Peru and how certain cultural norms impact the way he treats patients. For example, he told me that certain populations that live in the mountains surrounding Cusco are somewhat “mystical” with their health care beliefs, so he must incorporate that into his diagnostic explanation. My inner anthropology nerd loves to explore these connections between culture and medicine! First, the Spanish professors and classes that I took at W&L helped to give me the necessary foundation to immerse myself in the culture and communities. Other classes in the Poverty and Anthropology departments gave me examples and case studies that I could apply to certain situations here in Cusco, but one of my favorite mantras is that you can only learn so much from books and lectures. Being in Cusco and experiencing real-life issues that are impacting the impoverished populations firsthand allowed for a whole new type of learning. I will definitely bring back my love for the culture of Peru and I hope to share many of my stories with friends and members of the W&L community. This experience definitely has impacted my future plans. Going into the internship, I was dead set on working in the global health sector. While I still will incorporate global health into my career, I don’t want it to be the sole focus of my career. I was really struck by the close-knit bond the doctors had with their patients, and it made me think about potentially working in primary care in a rural setting in America. International experiences like this are so important to W&L students because it opens them up to the world and allows them to see through a new cultural lens. As liberal arts students, we constantly need to learn and expand our horizons so we can bring those experiences to future issues and challenges we will tackle. I have grown so much from this experience and will constantly apply the lessons I learned in Peru to things in the future.